Brief Description: Tall reddish “thread” that grows above the grass blade. While no one wants their lawn to be infected with disease, red thread is perhaps one of the most desirable. 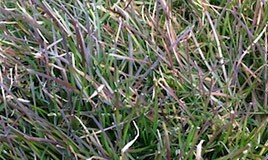 Unlike other lawn diseases, red thread does not kill grass. Instead, it simply grows on top of grass as a host. Red thread also may not re-infect your lawn in the future provided you treat it correctly, unlike other fungi that can continue to infect grass without extensive treatment. It prefers cool conditions and is more common in spring and fall than summer. It is also more likely to occur if the turf isn’t receiving the proper amount of nutrition. Red thread creates small patches of reddish tinted grass that from a distance may make the grass appear dead. These patches are often confused with dollar spots and other lawn diseases. But upon close inspection it is easy to see the red, thread like material that seems to grow out of the top of grass while the blades themselves remain intact. There may also be a pink fluffy material named “mycelium” that can be found on the bottom of the blades of grass. The simplest way to control red thread is to use nitrogen based fertilizers. Red thread can be drastically reduced when a lawn receives nitrogen based fertilization for several years. Like many other types of fungi, it is also important to make sure that you avoid watering your lawn late at night when the moisture will stay in the ground for too long and become dew the next morning. Because the disease is mostly a visual problem, rather than a lawn health problem like many other types of lawns diseases, treatment may not be necessary. Often the red thread will go away on its own through general lawn maintenance. But when red thread becomes too pronounced or you are looking for a more immediate treatment, fungicides may be used and have a high success rate.